(STATS) – It’s great to be the FCS national champion, but James Madison is finding its CAA Football opponents are treating each matchup as a national title game. Delaware was the second straight CAA team to give its best shot at James Madison, but once again the top-ranked Dukes had plenty of moxie to post a 20-10 victory at Delaware Stadium. 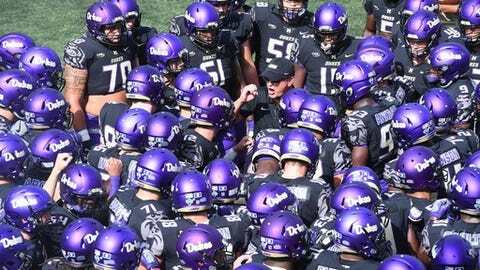 While pushing their Division I-best win streak to 17 games, the Dukes (5-0, 2-0) tied the CAA’s all-time record for consecutive victories, first set by Richmond in 2008-09. Junior Trai Sharp led the way by carrying the ball 36 times for 185 yards and a touchdown. James Madison took the lead for good midway through the second quarter on defensive end Andrew Ankrah’s first career touchdown, which made it 14-10. Delaware quarterback Joe Walker threw a poor backward pass that Ankrah scooped up on a bounce and returned 23 yards for the score. But the Dukes had to grind out the win as senior quarterback Bryan Schor, the 2016 CAA offensive player of the year, suffered through a subpar game (93 yards passing, one interception) against Delaware’s strong defense. It didn’t help that a 21-play Dukes’ drive in the third quarter ended with a missed field goal, which kept the score 17-10. Tyler Gray made two other field goals in the second half, including a career-best 48-yarder with 2:50 left to provide breathing room at 20-10. Plus, the Dukes have an excellent defense of their own, and it held Delaware (2-2, 0-1) to 229 yards and kept the Blue Hens scoreless over the final 41 minutes, 53 seconds. They’ve surrendered 58 points this season, with only 37 charged to the defense. Linebacker Brandon Hereford had a team-high 11 tackles with a sack in his season debut after serving a four-game team suspension. Safety Raven Greene had an interception and forced a fumble. The Dukes gladly move into their bye week as the first FCS team to get to 5-0. They get to refresh before next hosting Villanova on Oct. 14.